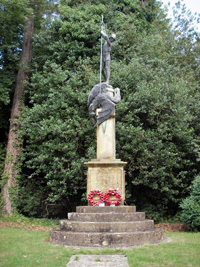 Stanway War Memorial is situated at the junction of the B4077 road (which runs from Stow-on-the-Wold to Teddington Hands) and the southernmost end of the Stanton Road. In the church the same WWI names are carved either side of the one window. Note: The above memorials may well also include dead from the village of Wood Stanway and the small hamlet of Taddington, both of which are in the parish of Stanway.